Commencement ceremonies for fall 2016 graduates will be held on Dec. 10 in Trask Coliseum. More than 1,548 undergraduates as well as nearly 446 graduate students and seven doctoral students are slated to participate in one of two ceremonies, which will be streamed live. The ceremony for the professional schools (Cameron School of Business, Watson College of Education and the College of Health and Human Services) will begin at 9:30 a.m. Jack Barto, President and CEO of New Hanover Regional Medical Center, will deliver remarks. The College of Arts and Sciences commencement exercises will begin at 1 p.m. UNCW associate professor of communication studies Jeanne Persuit will give the address. Graduates should arrive to Hanover Gym (adjacent to Trask) one hour prior to the start of their ceremony. Faculty are to report to room 119 in Trask, 30 minutes prior to the start of the ceremony. The doors to Trask will open one hour prior to the start of each ceremony. Tickets are not required and seating is available on a first-come, first-serve basis. The UNCW Alumni Association invites all graduating students and their families to the Wise Alumni House for a pre-graduation celebration at 5:30 p.m. on Dec.9. Enjoy complimentary hors d'oeuvres, refreshments and door prizes, meet the Alumni Association Board of Directors and find out about life after classes. In addition, graduates are encouraged to participate in the Career Center's First Destination Survey. For information about parking, departmental receptions and FAQs, please see uncw.edu/commencement. Social media users can use #UNCW2016 to tag commencement-related posts. Rebroadcasts of the ceremonies will be shown via The Learning Network at a later time. 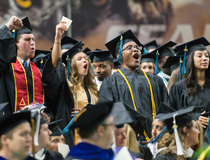 A photo gallery and video of the ceremonies and related events will be posted to the UNCW homepage the week of Dec. 12.